This Scale Aircraft Conversions set for the fairly recent Revell 1/72 Shackleton AEW.2 kit. Like most of you, I was surprised and delighted to see this released even if I'd probably never actually build it. The Shackleton's landing gear can be a bit fussy to get aligned, but thanks to cast metal with its ability to be slightly tweaked, that should not be an issue. 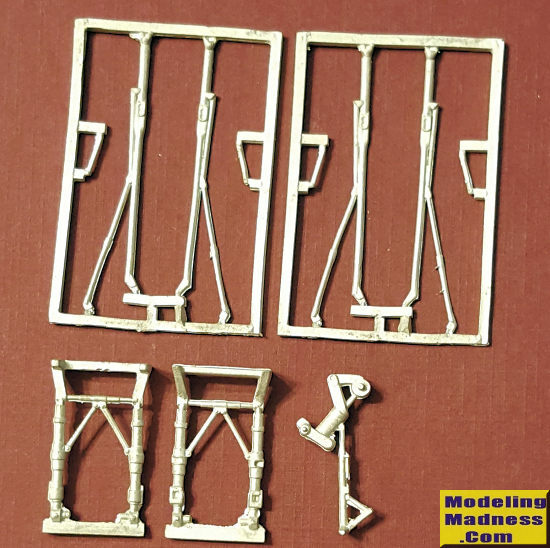 This set duplicates the kit parts and includes both the main gear legs, the retraction braces and a tail gear. These are direct replacements for the kit parts and are nicely molded. You can order these direct at http://www.scaleaircraftconversions.com if your local hobby shop or favorite on-line retailer does not stock them.